Not sure what is the “real” policy of the developer in this matter. Well, problem is not with missile specs, I`d say. Its more about damage modelling and can not be resolved easy because of diverse selection of munitions represented in SB and the lack of certain information, not available in public domain. For what I know, the Kornet is the AT-14 (not AT-4C), much more powerful, but requires an ATGM infantry team to be fired. 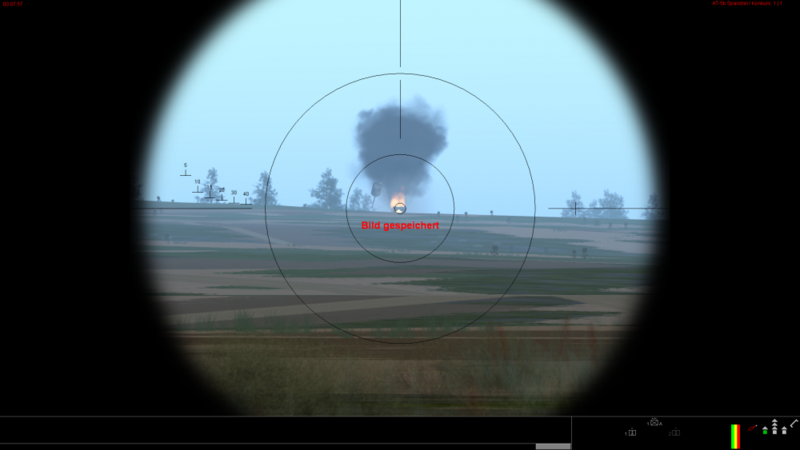 Try those against Leopard 2s and compare the results with your videos. A gentle reminder Ssnake: although mentioned in the release notes as having new models, the rejuvenated AT-7, AT-13, and AT-14 have yet to make it into the Personal Edition. Personaly, I don't see what the problem is. The newer russian ATGM in steelbeasts have no problems offing Leopard 2A4 from the front. What exactly are you complaining about? Can you please send me the record file. Well, sure, we have multiple construction sites open, this being one of them. I just wanted to point out that we may not be seeing AT-4 and AT-5 missiles in those videos, but the by far more potent AT-14 (Kornet). To that extent it may be, well, not exatly an apples and oranges comparison - but, say, lemons and oranges. Yes, they are all Russian ATGMs but it shouldn't be much of a surprise if a 152mm HEAT warhead from the mid 1990s will outperform a 120mm HEAT warhead from the early 1970s (even if the later variants, as demonstrated by Grenny, are potent enough to kill a Leo 2 frontally). I want to take all critique seriously, but I would appreciate if you would present your cases with the basic homework being done. 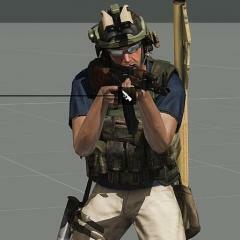 A 'Quality' option for vehicle crews, ideally with lower values having higher chances of crew 'bailing out' or 'breaking' when hit or damaged, with the option to 'bail' crews voluntarily ( for example when a vehicle is severely damaged/ non combat effective and immobile, the crew can bail and retreat/hide ). Score value of crews and vehicles could be counted separately, so the loss of a vehicle is not as bad as the loss of vehicle and crew. I know that this is unlikely to ever be added due to various reasons, but i can imagine ways of it being implemented in SB. Its something you see in many board games (and some video games) and i think it adds a 'human' element. I agree on bailing crews. Even if all they do is jump out, scatter, go prone, and disappear, I think it would add immersion. Plus I agree with the option to tell a crew to just forget it and bail out. If only to help clean up a scenario by making sure that realistically knocked-out vehicles won't be left hidden in a clump of trees screwing up a trigger/objective. well sure, bailing crew would also add a visual cue to a tank being dead, similar to smoke and fire, at least on AFVs without a belly escape hatch. there would be quite some work involved though. first and foremost for the most barebones bailing crew, we'd need special blank frames added to each vehicle. these would be the exit frames where the crew are spawned when they "bail". given there is 200+ vehicles in SB, that'd be quite a gargantuan job in itself. then we'd need to add a damage condition when crew would bail. then there's the case of animation if we chose to do that. for vehicles with accessible belly escape hatches, IFVs and APCs, not that much of an issue, crew escapes with troops through troop hatches. usually. but for the remaining tanks like M1 series, T-72, T-80 etc. individual escape animations for each crewmember would have to be made, which is quite time consuming. and then again this would have to be individually linked in code. and the timing tweaked so the crew doesn't spawn before the exit animation is done. things get even more complex if you don't want to simply have the crew climb out of the hatch, down the side of the turret wall, and then magically spawn on the ground. with extra added blankframes on hull rear and hull front, with extra exit animation. with separate exit locations depending on turret rotation. but realistically, this would never ever be done in SB, and even a bailing animation from the turret would be quite a stretch. That does sound like a huge pain in the balls. I dare say though, that as with other things in SB there could be some 'abstraction' applied that wouldnt require that amount of animating and damage model tweaking etc. 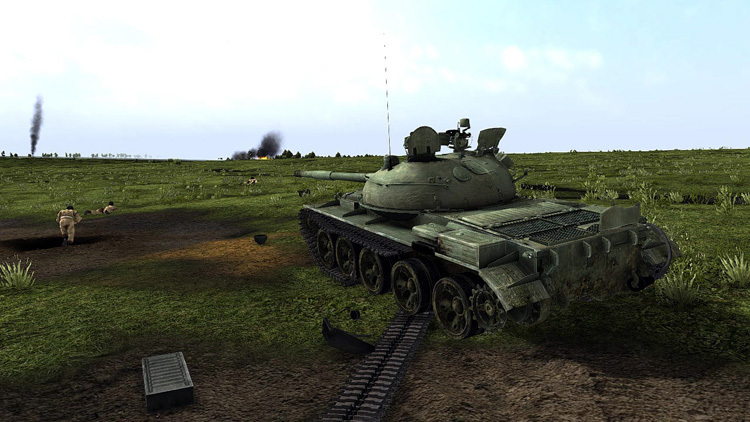 Ie; in the case of voluntarily bailing crew ; spawn an inf section (crew) behind the vehicle as you would with dismounts and destroy the vehicle. Or in the case of crew bailing due to 'breaking' ; failing a 'die roll' morale/quality check when hit or severely damaged that causes them to bail, spawn troops and destroy vehicle. But then you may well end up with a compromise that no one wants. Ie; in the case of voluntarily bailing crew ; spawn an inf section (crew) behind the vehicle as you would with dismounts and destroy the vehicle. Or in the case of crew bailing due to 'breaking' ; failing a 'die roll' morale/quality check when hit or severely damaged that causes them to bail, spawn troops and destroy vehicle. 1. They have the wrong weapons, too much ammunition, and other things that are fine for an Infantry section but not a group of guys scambling to get out under fire. Conversely if they deliberately abandon the vehicle not under fire (e.g. to conduct a foot recon) then maybe they do so with more ammunition, but they are never going to have a MG or maybe RPGs, etc. I get that its a wish list, but some are harder to achieve than others. May I remind those working for eSim that technical details like these are not to be discussed publicly. There's that NDA clause in your contract that you may want to read again. 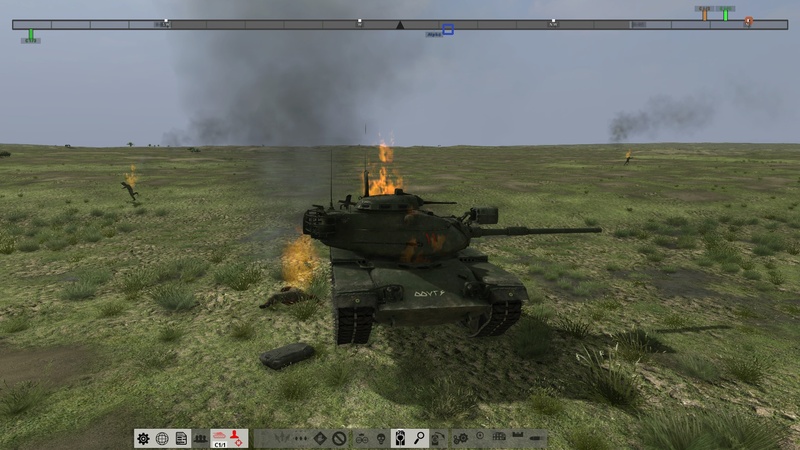 An interesting mechanic would be if you as Platoon commander had your tank disabled or destroyed, to be placed on the map (as part of the bailed out crew) and be required to make your way to another vehicle in your platoon to regain control of that vehicle and thus the platoon. Clicking "next vehicle" seems a bit too easy although I realise it may not be easy to program. As a follow up the next question would be "what if the player is then hit by enemy fire while bailed ?". Perhaps the first time make him go to crouch stance a second time go (And stay) prone thus delaying his ability to regain control. A third time - well it would need to have no effect as the player is invulnerable (As he is now). This would add another tactical decision as a player. Try to make your way to the MBT 600 yards away and greater protection ? or the easier safer/quicker trek to an APC that may be only 50 yards away. Players that don't want to go through all that could still click "Next Vehicle"
Again - might not be worth all the programming work but I think it would be more immersive. But then what about the crew of that tank... they'd have to get out. that way they still can"control" the platoon... so clicking to next vehicle may count a valid abstraction. To be honest I'm not sure. Not military myself so do not know if a commander wears a radio that he could still use to control his platoon if he had to bail. If its something he has to reach for my guess would be it would depend on how quickly he had to get out and if he was in the state of mind to reach for it. I think it would be interesting - if valid. As for the crew I suppose they would just act as an independent squad after the player transferred out to another vehicle. For an ongoing operation, you'll not wait for a leader to get somewhere on foot and climb onto a new vehicle. They'll be picked up by following forces. If the plt--ldr looses his ride, the 2IC will simply take over command and carry on with the mission. If he can see him, he 'll report the position to higher ups, so they can be assisted/picked up. Still, having crew bail out would add to the immersion as a GAME , a training value is limited to non existant. may have been mentioned, but in the fire control options when you selecting range, would be nice to also have type of target you want that vehicle to fire at. IE, I don't want ITV's firing at PC's when I have PC's that can take them out, but do want them firing at tanks. crew bailing i also something id like to see. Even if its not as simple as it sounds. Apart from more realism, IMO bailing crews will also have training value. A trainee would make an effort to end the mission with all his men accounted for. Officers jumping from tank to tank would also add to realism. Even though no one is waiting for him, an officer whose tank broke is ordered to get back leading his formation ASAP. However, implementing this may not add much training value. One can just wait a bit before he clicks "Next Vehicle". The ability to place military structures and objects (hesco walls, towers, tents, etc) in the mission editor rather than having to edit the map. This will be a much bigger deal if the new terrain engine is implemented. Not necessarily, as you always have the option to create a "delta map" that will be (very) small in size if the barriers are all that you add compared to a base map, and they can still be embedded in the scenario file. I concede that it would be more convenient and in would make more sense from the tactical/user interface perspective, but as long as we're under serious time pressure in our development we have to settle for "minimally invasive" changes to the code base.